This is an excellent little promotional item and becomes very useful to your business once it gets printed up with your business details and company logo. The Sheraton Coffee Mug With Logo from the mug department here at Calendar Lady Promotions is a popular tall ceramic coffee mug with the capacity to hold up to 230ml of tea or coffee. So advertise your business detail and company logo upon our Sheraton Coffee Mug With Logo today! To find out more about our Sheraton Coffee Mug With Logo click here and fill in the contact form and we'll get straight back to you. 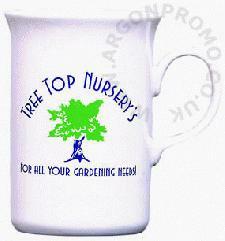 Other promotional and personalised items besides our Sheraton Coffee Mug With Logo click here.